The government is in discussion with the private sector to amend some of the taxes recently imposed on it, which have been identified as hindering the growth of the private sector, Prime Minister Ranil Wickremesinghe revealed. The premier stressed that the government was compelled to collect higher revenues through the implementation of new tax proposals immediately following the formation of the government, for debt repayment, where Sri Lanka has to pay over US $ 3-4 billion or a quarter of the overall US $ 12 billion debt, during the next few years, which includes foreign debt repayments. Speaking at the ‘Most Admired Companies of Sri Lanka’ award ceremony jointly organised by the International Chamber of Commerce Sri Lanka (ICCSL) and Chartered Institute of Management Accountants (CIMA) Sri Lanka last Monday, he announced that the government had decided to make adjustments to certain taxes, which were implemented following discussions with the International Monetary Fund (IMF) recently, upon the completion of the first year to boost the private sector. “Debt servicing means collecting higher revenues. The tax proposals that are now being implemented are not arbitrary. Certainly they are results of discussions with the IMF and the package introduced by them but we realised there were going to be problems and we said let the first year go by and then make adjustments. Already we are in discussion with the private sector, both in Colombo and the provinces, on what amendments have to be made and those have been fruitful discussions,” he said. Wickremesinghe recalled that Sri Lanka enjoyed economic growth rates of 8 percent during the post-war period, while pointing out that the growth was driven by the non-tradable sector, mainly the construction sector led by public infrastructure financed through foreign debts. However, he noted that this post-war economic growth rates were only temporary as they subdued after 2013, failing between 4 percent and 4.5 percent, which was further worsened by the weather challenges. “The investment activities that took place in the preceding period were not targeted at sectors that have potential to sustain high economic growth for capacity expansions and productivity improvement. I would like to remind those present here that the merchandise exports of Sri Lanka, as a percentage of GDP, have declined from 33 percent in 2000 to 13 percent of GDP by 2017. That is the hard truth. Trade openness has also reduced from 77.4 percent to 37.14 percent,” he said. If you take the average combined growth rate, our exports are only one-third of the total GDP growth rate,” he elaborated. The prime minister highlighted that other regional peers such as Bangladesh during the same period, were able to increase their exports by focusing on the tradable sector, contrary to Sri Lanka. “On the other hand, look at Bangladesh, it kept focusing on high productivity sectors and their export earnings went up from US $ 12 billion to US $ 35 billion, nearly a threefold increase in export earnings,” he said. 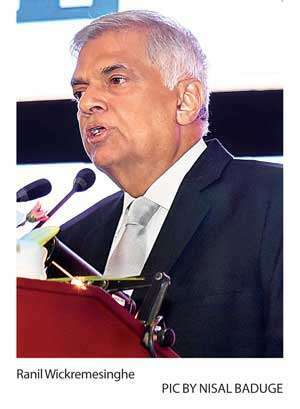 Speaking of the economic restructuring agenda of the government to move the focus of the economy from the non-tradable sector to tradable sector, Wickremesinghe pledged the support for private sector firms, which are willing to take up on the task regardless of their size. “A restructuring means refocusing on tradable goods and in this game, there will be winners and losers. Inevitably the losers will complain and the winners will stay quite. We took on a challenge and we still have 2019 to get through and with good economic management, we will do that. But it does mean that we need a private sector willing to take up this challenge. We need to back all of those who are willing to make a move. I won’t distinguish between the fly and the tortoise, as long as they are moving forward; that is all I want. We have to think of our future,” he said. The government has commenced discussions with the private sector to finalise the trade adjustment package, to support the industries, after receiving the Cabinet approval for the proposal in principle. According to the Development Strategies and International Trade Ministry, the government has begun discussions with the chambers and other industry associations. The president and finance minister had earlier submitted their observations to the proposal, while a few more ministers are also expected to submit their observations in the next couple of days. The proposal is expected to go back to the Cabinet for the final approval after incorporating the comments from the private sector and government agencies. The trade adjustment package is aimed at extending the state support to local firms to enhance the production capacity, venture into new markets, adjust current production to move from one line of business to another and access new technology to upgrade their products and production processes parallel to the trade liberalization process. The proposal recommends the establishment of a Trade and Productivity Commission (TPC) to be the independent body that analyses TAP alongside the trade liberalisation process. Speaking of the trade adjustment package recently, the prime minister said that the trade adjustment package would assist the Sri Lankan companies in the next five to 10 years to operate in a globalised economy. PM says outlook revision by S&P testament to govt.’s economic mgt.